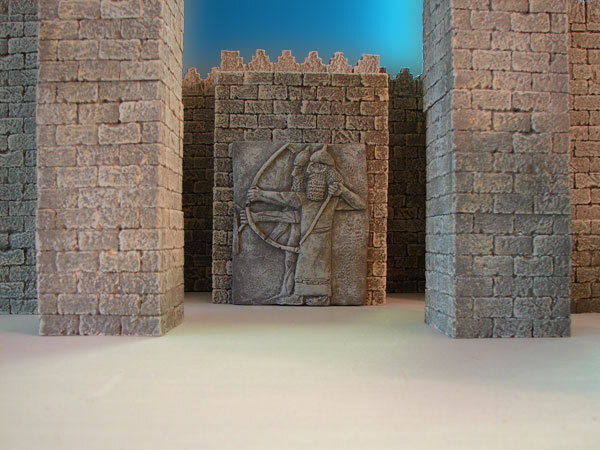 This miniature replica is of Assyrian archers from the army of Tiglath Pileser, King of Assyria, excavated from his palace at his ancient capital, Nimrud. The bas-relief was discovered at the site of ancient Nimrud during the reign of Tiglath-Pileser III (747-727 BC). The original is located at the British Museum in London. The limestone relief is a fragment of a tablet standing over 3 feet 7 1/2 inches tall. 2 Kings 15:29 - In the days of Pekah king of Israel, Tiglath Pileser king of Assyria came and took Ijon, Abel Beth Maacah, Janoah, Kedesh, Hazor, Gilead, and Galilee, all the land of Naphtali; and he carried them captive to Assyria. Note: Tiglath-Pileser's own words in his annals of "The Campaigns against the west, and against Gaza and Damascus" (733-732 BC.) says, "All their people and their goods I carried off to Assyria." 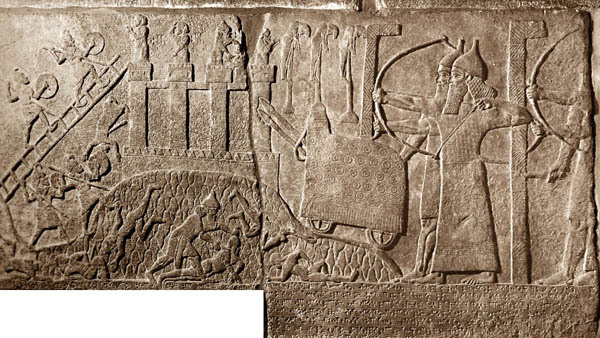 Although the chariot was the chief strength of the Assyrian army, the main offensive weapon was the bow (Assyrian qastu). The archer typically had a shield-bearer in front of him that wielded a tall metal shield that stood higher than the archer and it was curved inward at the top to protect the archer. There were also stone slingers nearby to take out assaults. The archer was free to fire off a multitude of arrows. A good archer from the Assyrian infantry could shoot 500-1500 feet no problem. The shafts were made of wood (or sometimes reeds) and the arrowheads were made of metal. The common archer had a quiver that could hold up to 50 arrows. The firepower that the archers brought during an attack was formidable. About 1 out of 5 Assyrian soldiers were archers, so imagine an army of 100,000 would have 20,000 archers as one Old Babylonian text from ancient Mari declares. - Gypsum relief from the palace of Tiglath Pileser III at Nimrud, his capital. - A good Assyrian bow with metal arrowhead could shoot over 2100 feet. - The detailed relief stands 91 cm (3 feet) tall. - Tiglath Pileser III reigned from 747-727 BC. - The event took place during Tiglath Pileser III's reign. - From the Neo-Assyrian Period (1000-612 BC). - Excavated at the site of ancient Nimrud (Calah). - Tiglath Pileser III was one of the greatest military commanders in history. - Many regard Tiglath Pileser as the founder of the Neo Assyrian Empire. - His rule was the beginning of the end for the northern kingdom of Israel. - He conquered upper Galilee around 736 BC and carried away captives. - He also attacked Samaria, Israel's capital, and carried away captives. - Ancient Nimrud (Calah) was excavated by Austen Henry Layard of Britain around 1847. - This stone panel was transported from India and is currently at the British Museum. - Nimrud (Calah) was Tiglath-Pileser's capital city (Northern Iraq). The Assyrian soldiers can be identified by their tall pointed helmets, although the archer and shield-bearer have helmets of an unusual design. In front of them is an Assyrian 'tank', a battering ram on wheels. These machines also provided platforms from which archers could shoot at close range. They were presumably moved by men, as animals might panic. On the left of the relief Assyrian spearmen wear a distinctive uniform with crested helmets, round shields and straps across their chests. Spearmen appear first in Tiglath-pileser's reign (745-727 BC), probably drawn from the western half of the Empire. An Assyrian soldier cuts off the head of an enemy soldier. A literal head-count was the standard means of estimating the numbers of enemy dead. You will never see a dead Assyrian depicted on an Assyrian relief. This alabaster wall relief is the upper part of a panel once divided into two registers by a central band of inscription. The remains of text at the bottom, removed by the excavator in the nineteenth century to reduce the weight, is not directly related to the carvings. However, a separate caption at the top gave the name of the town as U[pa? ], possibly in Turkey. The first great military empire in ancient history was the Assyrian Empire. By the time of Ashurnasirpal and Shalmaneser III in the 9th century BC the Assyrians organized a mighty army of nearly 200,000 soldiers. Their military strategy was unsurpassed up to that time, and with the age of iron they were an unstoppable fighting machine. They brought spearmen, archers, shieldmen, slingers, siege engines, chariots, and a huge calvary into the battlefield. The mighty Assyrians dominated the ancient world until they were crippled by the God of Israel in the reign of Sennacherib. 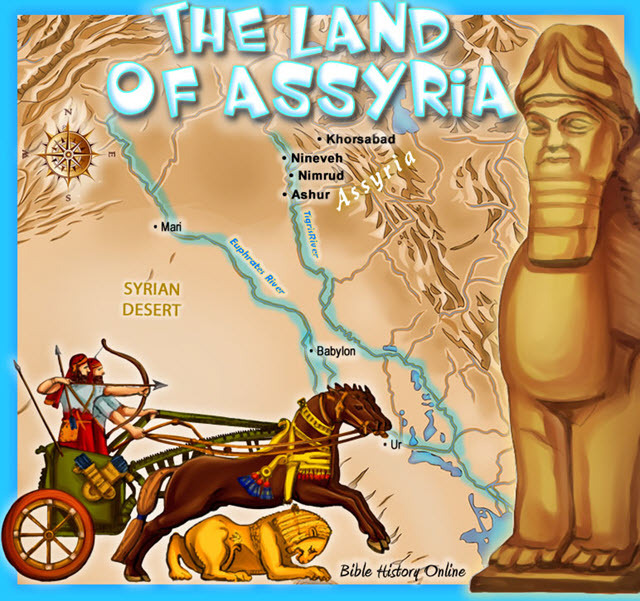 God raised up the Assyrians to remove Israel out of his sight for their rebellion and idolatry, but the Assyrians would also be punished also for their wicked ways. They finally fell to the Medes and Babylonians in 612 BC and passed into history. 2 Kings 15:19 - Pul the king of Assyria came against the land, and Menahem gave Pul one thousand talents of silver, that his hand might be with him to confirm the kingdom in his hand. 2 Kings 18:9 - And it came to pass in the fourth year of king Hezekiah, which [was] the seventh year of Hoshea son of Elah king of Israel, that Shalmaneser king of Assyria came up against Samaria, and besieged it. 2 Kings 19:16 - LORD, bow down thine ear, and hear: open, LORD, thine eyes, and see: and hear the words of Sennacherib, which hath sent him to reproach the living God. 2 Kings 19:37 - And it came to pass, as he was worshipping in the house of Nisroch his god, that Adrammelech and Sharezer his sons smote him with the sword: and they escaped into the land of Armenia. And Esarhaddon his son reigned in his stead. Ezra 4:10 - and the rest of the nations whom the great and noble Asnapper brought over, and set in the city of Samaria, and in the rest of the country beyond the River, and so forth, wrote. Assur-nasirpal II (885-860 B.C.) A cruel warrior king, he made Assyria into the most fierce fighting machine of ancient world. Shalmaneser III (860-825 B.C.) His reign was marked by almost constant war. He was the first Assyrian king to come into conflict with Israel. King Ahab fought against him, and king Jehu paid him tribute in 841 BC. His royal inscriptions were more detailed and more numerous than any other king. His building works were massive just like his father Assurnasirpal II. See Shalmaneser and the Black Obelisk. Shamsi-Adad V (825-808 B.C.) Most of his reign was focused on Babylonia and his own internal conflicts. Adad-nirari III (808-783 B.C.) The little information about his reign mentions his building projects at Calah and Nineveh, as well as a conflict at Der in Babylonia and collecting tribute in Damascus, Syria. Shalmaneser IV (783-771 B.C.) The limited knowledge of his reign reveal some conflicts in Damascus and a period of decline in Assyria. Assur-dayan III (771-753 B.C.) The little information about this ruler reveals Assyria being in a period of decline. Assur-nirari V (753-747 B.C.) There is very little information about his reign. The king of Urartu boasted of a victory over this king of Assyria in an inscription. Tiglath-pileser III (Pul) (747-727 B.C.) He restored Assyria to a major world power. He is the "Pul" mentioned in the Bible and the one who began to destroy Samaria, the capital of the Northern Kingdom of Israel. He carried many away into captivity. This captivity is mentioned in his own inscriptions, the Babylonian Chronicle, and the Bible. Shalmaneser V (727-722 B.C.) He besieged Samaria, the capital of the Northern Kingdom of Israel. He died during the siege after imposing taxation on the holy city (Asshur), and his son Sargon came to power. Sargon II (722-705 B.C.) He completed the destruction of Samaria and the captivity of Israel. He was also famous for his magnificent palace with his colossal winged guardians. Sennacherib (705-681 B.C.) He was the most famous of the Assyrian kings. He mentions the name of Hezekiah on his prism during his war campaigns, he claimed to have "Hezekiah captured in his own royal city (Jerusalem) like a caged bird." His army was defeated at the gates of Jerusalem by the Angel of the Lord. Sennacherib returned back to Nineveh and was killed violently by his own son, as mentioned in the Babylonian Chronicle, The Bible, and various other inscriptions. He also conquered Babylon. Esar-haddon (681-668 B.C.) He rebuilt Babylon, invaded and conquered Egypt by crossing over the Sinai Desert with Arab camels carrying water for his army, and was one of Assyria's greatest kings. He died fighting Egypt. Assur-banipal (668-626 B.C.) He destroyed the Thebes in Egypt and collected a great library, innumerable clay tablets were found. Assur-etil-ilani (626-607 B.C.) It was under his reign that the Assyrian Empire fell. Assyrian annals mention contacts with some ten Hebrew kings: Omri, Ahab, Jehu, Menahem, Hoshea, Pekah, Uzziah, Ahaz, Hezekiah, and Manasseh. In the reign of Hoshea, king of Israel, Shalmaneser, king of Assyria, twice invaded (2 Kings 17:3,5) the kingdom that remained, and his successor Sargon II took Samaria in 722 BC, carrying away 27,290 of the population as he tells in his Khorsabad Annals. Later Assyrian kings, particularly Esarhaddon (681 BC - 668 BC), completed the task. The Assyrian Annals. The scribes of the chief cities of the Assyrians wrote the accounts of the king's military campaigns on cuneiform tablets, and clay prisms or cylinders. The accounts are very reliable, even though the accounts do not speak negatively of the Assyrians and are meant to glorify the king. The annals also give much detail to geography and Chronology. It is interesting how accurate the Assyrians were with dates, they made use of an Assyrian Kings List or the Eponym Canon. The Assyrian Chronicles and Eponym Canon. The Assyrian scribes organized their national events whether military, political or religious every regnal year. The Babylonian Chronicles were structured the same way. Assyrian records were kept very carefully, they took their dating and their history seriously. They attached their record of events with the solar year and with the name of an official who was known as the "limmu." Their was a new limmu appointed every year. They recorded military, political and religious events in every year and made references to eclipses. The Assyrian records are highly dependable and allow Biblical scholars a very accurate way of dating events and designating "eponyms" for 244 year in Hebrew history, from 892-648 BC. The Assyrian King List. The Assyrian King List reveals a list of the kings of ancient Assyria in chronological order, from the 2nd millennium BC to 609 BC. It lists the name of the king, his father's name, the length of his reign, and some great achievements. Assyrian Sculptures. The limestone bas-reliefs discovered from the palace walls of major Assyrian capital cities like Nineveh (Kuyunjik), Nimrud (Calah), Khorsabad (Dur-Sharrukin), and the bronze bands on the Balawat Gates reveal a wealth of history. The illustrative events were carved be professional Assyrian artists like a modern day photographer on the scene. The carvings reveal the military might and tactics of the Assyrians, as well as the futility of those nations that defied their might. These sculptures are on display in museums around the world, for example: The British Museum in London, The Louvre in France, The Iraqi Museum, and The Oriental Institute in Chicago. The Bible. The Old Testament records the history of the Kingdoms of Israel and Judah, along with the battles of other nations. It includes the fall of the 10 tribes in northern kingdom of Israel in 722 BC by the Assyrians, as well as the fall of the southern kingdom of Judah in 586 BC by Nebuchadnezzar of Babylon. The Bible also records miraculous events surrounding people like Elijah, and Jonah, as well as the slaying of 185,000 Assyrians at Jerusalem by the Angel of the LORD. The events recorded in 2 Kings generally agree with Assyrian and Babylonian sources.